This medication is used to treat certain parasitic roundworm infections. Curing parasitic infections helps to improve your quality of life. In people with weakened defense (immune) systems, curing roundworm infections can reduce the risk of developing a severe or life-threatening infection. Ivermectin belongs to a class of drugs known as antihelmintics. It works by paralyzing and killing parasites. Take this medication by mouth with a full glass of water (8 ounces or 240 milliliters) on an empty stomach at least 1 hour before a meal. Ivermectin is usually taken as a single dose or series of doses, or as directed by your doctor. Dosage is based on your weight, medical condition, and response to treatment. What conditions does Ivermectin treat? Headache, dizziness, muscle pain, nausea, or diarrhea may occur. If you are being treated for "river blindness" (onchocerciasis), you may experience reactions to the dying parasites during the first 4 days of treatment, including joint pain, tender/swollen lymph nodes, eye swelling/redness/pain, weakness, vision changes, itching, rash, and fever. If any of these effects persist or worsen, tell your doctor or pharmacist promptly. To reduce dizziness upon standing, get up slowly when rising from a sitting or lying position. Tell your doctor right away if any of these rare but very serious side effects occur: neck/back pain, swelling face/arms/hands/feet, chest pain, fast heartbeat, confusion, seizures, loss of consciousness. List Ivermectin side effects by likelihood and severity. Before taking ivermectin, tell your doctor or pharmacist if you are allergic to it; or if you have any other allergies. This product may contain inactive ingredients, which can cause allergic reactions or other problems. Talk to your pharmacist for more details. If you have traveled or lived in West or Central Africa, you may be infected with certain parasites (such as Loa loa, African trypanosomiasis) that could cause problems with ivermectin treatment. These effects could rarely result in serious (possibly fatal) effects on the brain (such as encephalopathy). Consult your doctor for more information. If you have a weakened immune system (such as due to HIV infection), you may need repeat treatments with this medicine. Talk to your doctor for more details. Ivermectin passes into breast milk. Though there have been no reports of harm to nursing infants, consult your doctor before breast-feeding. What should I know regarding pregnancy, nursing and administering Ivermectin to children or the elderly? Some of the products that may interact with this drug include: barbiturates (such as phenobarbital, butalbital), benzodiazepines (such as clonazepam, lorazepam), sodium oxybate (GHB), valproic acid. If someone has overdosed and has serious symptoms such as passing out or trouble breathing, call 911. Otherwise, call a poison control center right away. US residents can call their local poison control center at 1-800-222-1222. Canada residents can call a provincial poison control center. Symptoms of overdose may include: numbness, tingling, trouble breathing, loss of coordination, seizures. Laboratory and/or medical tests (such as stool exams for intestinal parasites) should be performed periodically to monitor your progress or check for side effects. If you are being treated for "river blindness," you may need more medical examinations and repeated treatment because ivermectin does not kill adult Onchocerca worms. Consult your doctor for more details. 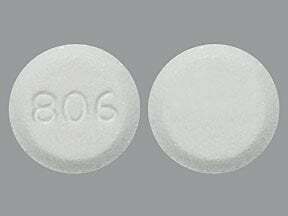 This medicine is a white, round, tablet imprinted with "806". Are you considering switching to Ivermectin? How long have you been taking Ivermectin?